We offer an excellent location with busy walk by traffic, "free parking" for clients and are ready to help you sell your home. 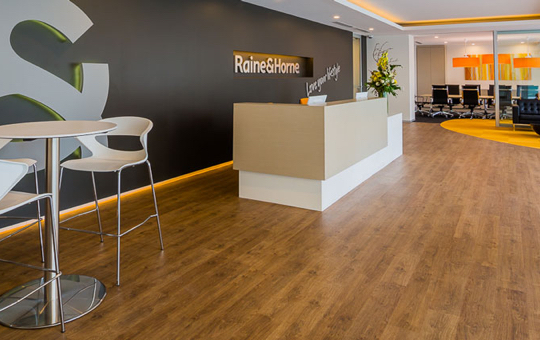 The team at Raine & Horne will give you exceptional service, with the focus on the best results for you. If you are thinking of selling, compare the difference that Raine & Horne will give, the friendly courteous service you will get is second to none. Our team is energetic with fresh ideas, so call us today you will not be disappointed. Raine & Horne is a "Superbrand" which is nationally recognised and associated with values of respect, experience and quality service. We will get your property in the hands of more buyers with our RH Referral System & Global Data Base. We are just a phone call away on 02 6583 2699. I just wanted to thank Raine and Horne for looking after us this year as we have rented at Long Point Drive. We have throughly enjoyed our time there and Scott and myself wanted to thank you, in particular Cheree. Thank You Cheree for firstly helping us find this property and answering any questions/problems straight away with no hesitation. We have found previously this service is not very common, as we have moved around into a lot of places and rented our own properties as well. We found Cheree very professional and always willing to help anyway she can and always followed up after. So we thank You Cheree and the rest of the staff at Raine and Horne for having us! We hope you have a good Christmas and all the best for 2017! Just a short note to say a very sincere thank you for successfully selling our latest property. That makes it three in the last four years and amazingly just a short three weeks from listing with you for this latest sale. To emphasise the relevance of this, it took up to five months earlier this year for three of Camden Haven’s leading real estate agents to get just one totally unacceptable bid ($150,000 under list price) on our Kew property. But you managed to achieve two bids, including the accepted bid, close to the list price in just 21 days. Your comments regarding considerably more enquiry directed to Port Macquarie, rather than Camden Haven, was clearly evident, not only in the greater amount of interest in our property through the internet and phone enquiry, but we believe also in a more qualitied potential buyer seeking inspections. We were most disappointed with the inspections we got through the Camden Haven agents. Several times we felt some of these inspections were either set up to justify the listing or our property was outside the buyers’ financial capabilities or their desired property profile. There’s no doubt about your intimate knowledge of and expertise in property sales in the Camden Haven area, having sold real estate in the area for many years, including two of our previous properties at Hannam Vale. Consequently, we would have no hesitation in recommending you personally and now Raine & Horne, Port Macquarie, to anyone in the Hastings area, and more specifically, Camden Haven, seeking a successful sale of their property.